The story of this family begins with James Janes who was born in Brighton, Sussex, then called Brighthelmstone, about 1820. His parentage and origins are unknown and the first positive infomration about him comes from his marriage in December 1843 at the church of St Nicholas to Emma Wood, daughter of Samuel and Sarah. Samuel was christened at St Nicholas' on 8 Nov 1796, son of Samuel and Mary Wood. He married Sarah, but nothing is known about her, nor whether they had any other children. Their one known child Emma, was born in 1826 in Kent Road, Brighton and she was baptised on 29 Oct 1826 at St Nicholas'. She appears to have been only 17 at the time of her marriage to James Janes. At the time of Emma' Grace's birth James was an invalid chairmaker. 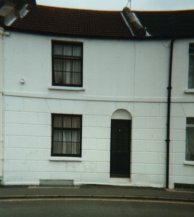 and they were living at 8 Regent Row in Brighton. (her birth certificate still says 'Brighthelmstone'). It was a densely packed area of small terraced houses round St Nicholas's church in the same area that both mother and daughter were to spend most of their lives. Though many houses where they live are still there Regent Row itself is now only workshops. Emma worked as a charwoman (presumably basic cleaning jobs). The next few years created a great deal of confusion around this family's history. James Janes died in May 1850 and was buried at the church of St Nicholas on 19 May 1850. He was described at that time as a 'flyman' and they had moved to 1 Marlborough St. These houses, on the northern fringe of what is now a 'fashionable', even 'quaint' shopping area were small yet crammed with lodgings, no doubt sometimes the occupants having no more than one room for their families. There was another lodger at 1 Marlborough St, a Trayton George Foord. Trayton came from the village of Ringmer just outside the town where his family had been for many generations. The 1851 census describes Emma as a laundress. She must have been finding it very hard to cope. This probably means that she simply took in washing. It could not have been long after her husband's death that Emma and Trayton were cohabiting. Their first step as a 'couple' was to have Emma's two children baptised. The reason for the delay is not known but having the children baptised in batches was a family habit which continued into the next generation. It is here that the confusion of names begins as the children appear to be recorded as Jones on the baptismal register. This 'evidence' is from the Vital Records Index and must be a mis-reading of an 'o' for an 'a'. Trayton and Emma's first child was born on the 15 April 1852. For a long time nothing was known about this as the enumerator on the 1851 census seems to have recorded Emma Janes as 'Emily Jones'. Emma also 'disappeared' from further censuses by marrying Trayton on 8 Aug 1852 in St Nicholas's, Brighton. They then went on to have seven more children. Perhaps it was only the first name that the enumerator mis-heard. The same problem could have arisen with the surname, that the transcriber simply read it as the more familiar 'Jones'. This raises some serious doubts about the recording of some of the Jones family as well as the Janes on any of these transcriptions but there is no doubt from the evidence of the marriage certificate that Emma Grace and her father James were definitely 'Janes' and not 'Jones'. A list of other Janes in Brighton ( not known to be related) is being compiled to add as a supplement to this page. It is not known when Trayton Foord senior died but it must have been before 1881 as Emma, now 'Emma Ford' is there described as a widow, working as a nurse. By this time Trayton junior had decided to change his name. He had been registered as Trayton Ford Janes and was baptised as Trayton James Ford but was now called John Janes. This of course created further confusion with the research but as the name was so rare led us eventually, through the Sussex mailing list to our cousin Margaret, a Ford descendant, and to the unravelling of this story. Three years later, on 18 Oct 1868 Samuel Janes married George Ricketts' sister Emma at St Nicholas Church, Brighton. He and the 'new' Emma Janes, went to live in the district of St George's Hannover Sq. with Samuel now working as a fishmonger. They had a son, Thomas William Janes born in the Jun Q 1871 but a death for a child of the same name is recorded in the Sep Q 1871 and Samuel died there in the Mar Q 1879. Emma is listed as a widow on the 1881 census as a laundress, born in Guildford, and living in the household of a Henry Solomon, carriage cleaner at 24 Palk Rd, Battersea. A possible death is recorded for her in the Sep Q 1908 aged 61 in Kensington but so far she has not been found in 1891 or 1901. The abbreviated family tree is repeated here from the Ricketts Family page to keep the main lines clear. In 1871 Emma and Trayton were living at 32 Foundry St. Emma never moved more than a block or so away from this street and may have been struggling with little more than one room. Most of these houses had two or even three families living in them! By 1881 Emma, widowed again, was living at no.12 Foundry St (right). 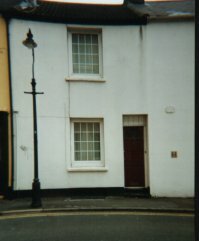 She had lived in the street before, in 1868, but at no.29. This young man was never quite satisfied with his name, using several other aliases in the course of his life though he seems to have settled lastly for John Traton Janes. Perhaps he wanted to emphasise his relationship to his older (half) brother and sister. Trayton James Ford married Fanny Marchant on 3 Jul 1880. By the time of the 1881 census. Now 'John Janes', he was living with his wife, and baby daughter of 6 months at no. 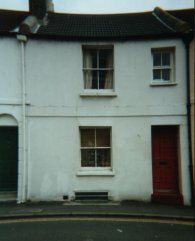 21 Foundry St (left) Among other lodgers was his mother-in-law Sarah 'Merchant', aged 71. In 1891 Trayton, alias John Janes, was living at no.17, Foundry St (right) His family continued to be known as Janes until the name died out with a female line. The Janes family story continues with Emma Grace and the Ricketts family of Merrow but the association with Brighton continued into the 20th century as the Ricketts lived there for much longer than in Merrow, the last known address of Emma Grace being still in the same area in 1901. Although Fanny Ricketts, her daughter, married in Woking she must have visited Brighton frequently for her husband chose to live there at the end of his life. The Brighton 'connection', whatever it had become, did not end until the death of Fanny's husband, George Jackson, in 1943. Mary Ford has not been found in any records after the 1861 census. Frank Ford married Sarah Lawson Carr on 1 Jun 1878 in St Peter's, Brighton, and had two children by 1881, Emma Ford in 1878, and Frank Trayton Ford. Phoebe Ford is almost certainly the 22 year old servant born in Brighton and working at 30 Sloane St, Chelsea in 1881. She was married at St George's, Hanover Sq in Sep Q 1881 but at present her husband's name is not known. Luke married Elizabeth (no surname known) and had 5 children. Our cousin Sue is a descendant on the female line of this family and has some details of 46 members. Supplement : other Janes in Brighton. The earliest known Janes family lived in Brighton a century before. They were John Jans and Charity and they had 5 children: Charity in 1707, a 2nd Charity in 1711, Judith, 1715, John 1719, and Richard 1722. Judith Jans married John Venner at St Nicholas on 30 Dec 1744. There is no evidence of any connection but the spelling is unimportant. Henry Janes, son of William Henry Janes, married Emma Lower Palmer, daughter of John Palmer at St Nicholas on 28 Nov 1868.